The LÄSSIG Bandanas made of interlock material are the mobile solution for baby's first teeth. 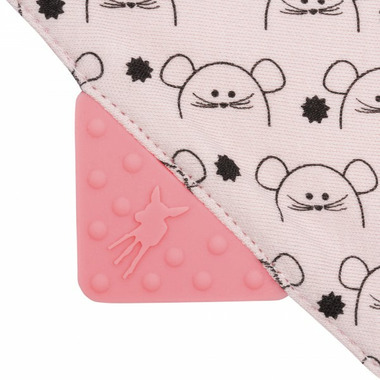 These bandanas made of high-quality cotton in various designs feature a silicone teether attached to the side, which has a pacifying effect during teething. Inside the material there is a thermoplastic polyurethane coating so that the child's clothes stay dry under the scarf. All the bandanas have snaps for easy opening and closing and are reversible. I wrote a lengthy review on the blue color and I guess I should've copied and pasted here. Anyway, this is my favorite bib and wish I only bought this and the Aden and Anais classic burp bibs for when baby was younger and would spit up milk.